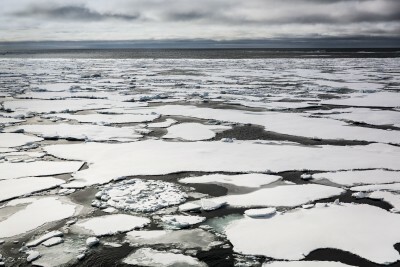 The Arctic is losing about 13 percent of its sea ice per decade, a reduction that will drastically shrink marine habitats for ice-dependent wildlife and may push some species to extinction. 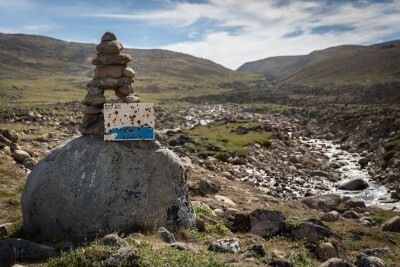 Fully one quarter of the world’s people – more than the total population of the Western Hemisphere – get their drinking and irrigation water from inland glaciers. Clearly, humans are dependent on ice; but ice is also dependent on humans. As we know, glaciers are retreating rapidly because of anthropogenic (human-made) climate change, and their prospects for replenishment seem unlikely. Ice is melting at the poles too, where the temperatures have warmed five times faster than the global average. As a result, sea ice, which is ice formed from ocean water, is diminishing in the Arctic. Although the cyclical melting of sea ice does not contribute to sea level rise, it is important for marine mammals: seals, walruses, arctic foxes, caribou, and polar bears depend on sure, stable ice for their resting and birthing places and their hunting and breeding grounds. 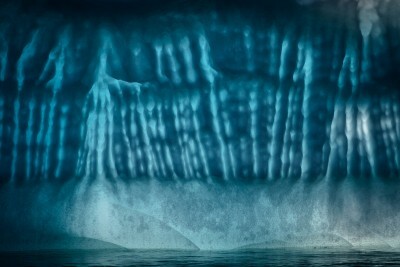 Sea ice reduction also reduces the “albedo effect.” Without reflective ice, the dark ocean water absorbs heat more quickly, causing even more ice to melt and ocean temperatures to rise further. The Arctic is losing about 13 percent of its sea ice per decade, a reduction that will drastically shrink marine habitats for ice-dependent wildlife and may push some species to extinction. 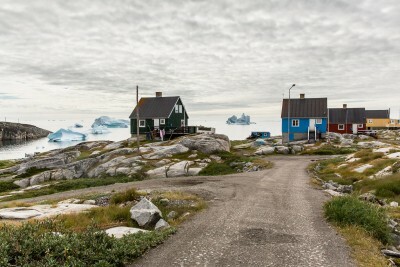 When polar land ice melts, sea level rise is affected. Land ice comes from the layer-upon-layer accumulation of solid frozen precipitation over a landmass. Often taking thousands of years to coalesce, land ice grows massively, forming ice sheets that can extend to more than 20,000 square miles (32,287 square kilometers). 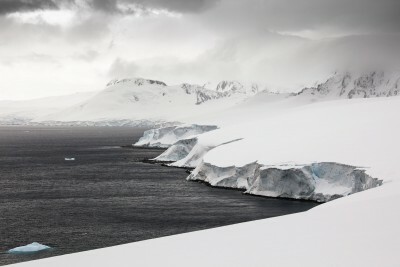 So, when warming temperatures cause large chunks of the West Antarctic and Greenland ice sheets to thin and eventually fall into the ocean, sea levels worldwide rise – currently at a rate of 0.14 inches (3.5mm) per year since the early 1990s. If either ice sheet melted completely, it could cause seas to rise by 16-23 feet (5-7 meters). 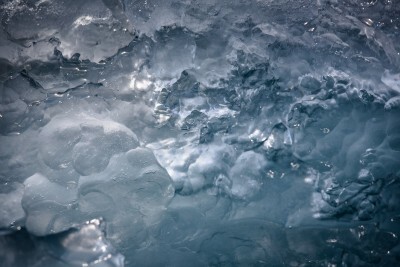 Ice melt is especially hazardous in regions normally covered in permafrost, or soil that remains at or below the freezing point of water for two or more years. Currently, in 2015, 24 percent of the exposed land in the Northern Hemisphere is covered with permafrost. But with observed warming of 3-5 degrees Fahrenheit (2-3 degrees Celsius) in Northern Alaska and Siberia over the past 40 years, permafrost is moving northward. While accurate records go back only to the 1980s, scientists believe the zone of continuous permafrost in Yukon might have moved 62 miles (100 kilometers) pole-ward since 1899. Because thawing permafrost releases methane, a greenhouse gas that is over 20 times more powerful than CO2, it threatens to melt even more permafrost. 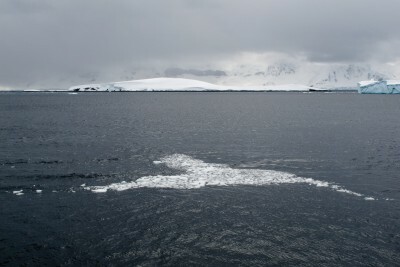 When I visited the Antarctic Peninsula in 2011, I thought many of the icebergs floating off the coast resembled fanciful animals or sea creatures, hinting at the marine life that live in these waters. It was thrilling to watch icebergs calve off glaciers in Iceland, Patagonia, Antarctica, and the Arctic, but it was also terrifying to know what this signified. Breidamerkurjökull, an outlet glacier of Vatnajökull, Europe’s largest ice cap, is steadily retreating due to a warming climate. 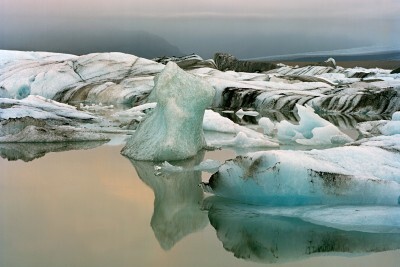 Jökulsárlón lagoon, where icebergs from the glacier collect before drifting out to sea, could eventually fill up with sediment as the glacier melts, taking away a beautiful and popular tourist destination. The Viedma Glacier in the Southern Patagonian Ice Fields of Argentina has retreated more than .62 miles (one kilometer) since the 1930’s. At its current rate of retreat, scientists predict it could disappear within 60 years. To trek safely on a solid area of the glacier, our group had to walk 15 minutes over these bare rocks that, according to our guide, were covered by ice just 20 years ago. Of the 150 glaciers that existed in the park when it was founded 100 years ago, less than 25 remain. And those glaciers are expected to disappear by 2030, if not earlier. 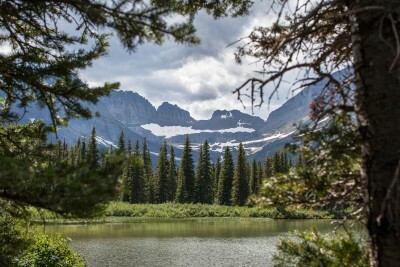 With climate change, trees and other vegetation in the park may migrate to higher elevations forcing animals to follow, but some species may not be able to survive this change to a new environment. 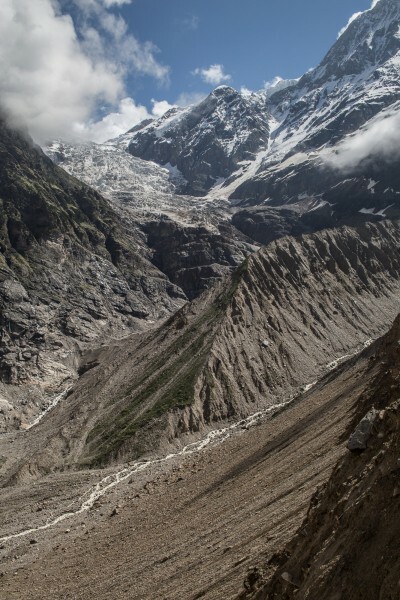 The Pindari Glacier, like many glaciers in the Himalayas, is revered as a sacred site for Hindus. More importantly, the glacier provides critical melt-water for cooking and drinking to villagers who live in this valley. Less than 20 years ago, the glacier extended up and over the now barren hill in the foreground. 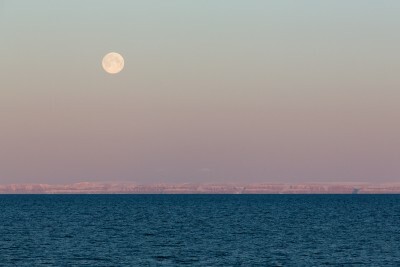 Decreased winter ice cover due to global warming is leading to more evaporation in the Great Lakes. The water levels of Lake Erie are already low and could drop 4-5 feet (1–1.5 meters) by the end of the century. The lake’s warmer temperatures are also increasing algae blooms in the summer months. With glaciers melting worldwide, it is possible to consider that perhaps all that will be left in the near future are memories and signs acknowledging where they used to be. 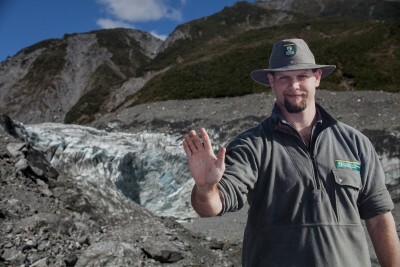 The Fox Glacier retreated approximately 328 yards (300 meters) over the course of 2014. According to the National Institute of Water and Atmospheric Research, the volume of ice in New Zealand’s glaciers have declined approximately 50 percent over the last century, while the country’s average temperature has increased by about 2 degrees Fahrenheit (1.1 degree Celsius). 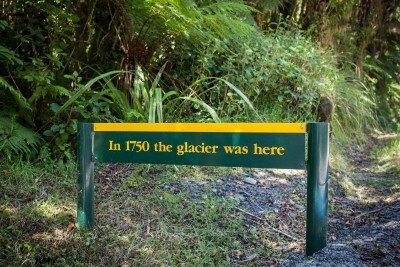 Both the Fox and nearby Franz Josef Glacier are popular tourist destinations attracting over 80,000 visitors a year. 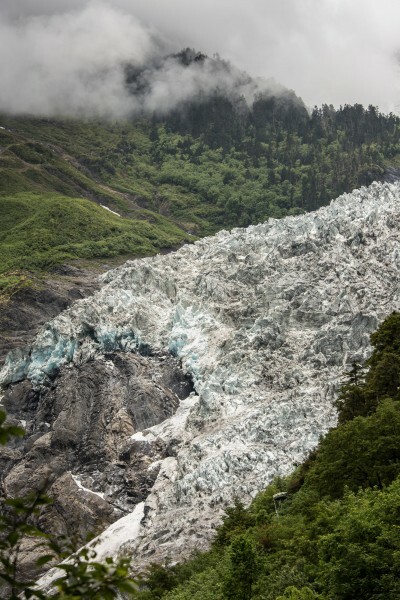 The inevitable loss of these glaciers is sure to impact the region’s economy. 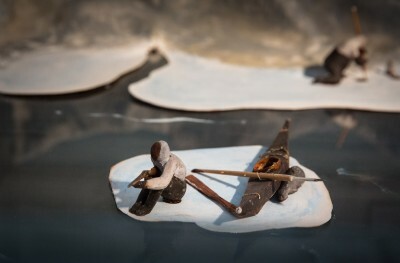 This wooden cutout of a ranger is there to warn tourists to stay away from the glacier’s unstable terminus. 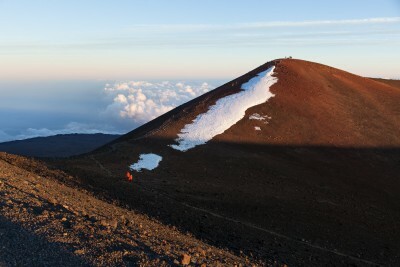 Translated as “white mountain,” Mauna Kea, a dormant volcano on the Big Island, has been a popular snowboarding and ski site for decades. But as global temperatures warm, there are many years when there is barely enough snow for even a short run down the mountain during the winter season. In the Tibetan Plateau in this northwest Yunnan province, temperature increases of twice the global trend are making the glaciers here recede at an historic pace. This warming is also predicted to increase the frequency and intensity of monsoons in the South China Sea, as well as affect global weather patterns. At the current melt rate, Chinese scientists believe that up to 40 percent of the glaciers in this region could disappear by 2050. This massive iceberg is just one of many that is breaking off of the continent’s ice shelves. Although impressive to view for its size and grandeur, warming ocean temperatures are increasing the melt rate of Antarctic ice. This is especially true in Western Antarctica where much of the continent sits on the Southern Ocean floor and not on frozen land. 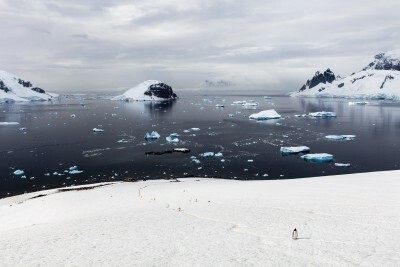 Temperatures in the Antarctic Peninsula have warmed five times faster than the global average. Over 20 billion tons (18 billion kilograms) of ice has been lost in Western Antarctica since 2001. 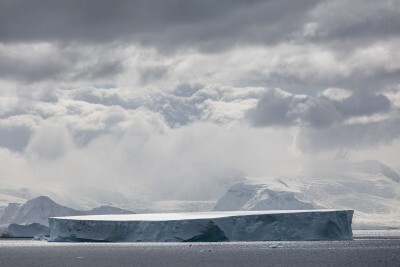 Sea levels could rise 16 to 23 feet (4-7 meters) if the Western Antarctic Ice Shelf melted completely. When I asked Canadian park ranger Pauline Scott about the effects of climate change around Pond Inlet she easily noted a long list of impacts: the obvious shrinking of the glaciers in Sirmilik National Park; the “slumping” of land from melting permafrost; the disruption of animal breeding cycles; the appearance of new birds, plants and insects; along with cooler, wetter, foggier, and windier summers caused by the increase in icebergs in local waters from Greenland’s glaciers. 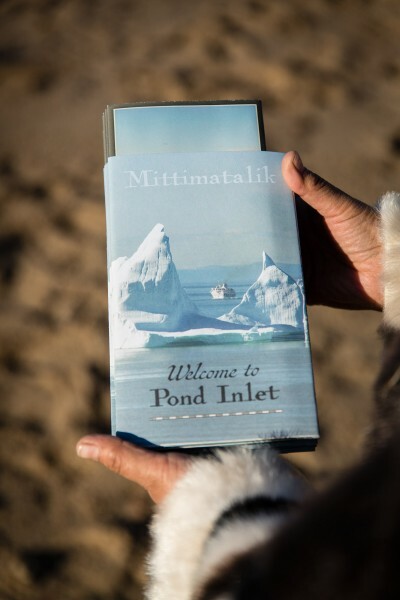 Although she has only lived there since 2001, she said most of these changes have been occurring in Pond Inlet, and elsewhere in the Arctic, for at least 50 years. Arctic sea ice has been decreasing 13.3 percent per decade since the early 1980s. In September 2012, a new record of minimal sea ice extent was set: 1.31 million square miles (3.4 million square kilometers). In February 2015, at 5.61 million square miles (14.54 million square kilometers), a new record was set for its annual maximum winter extent. 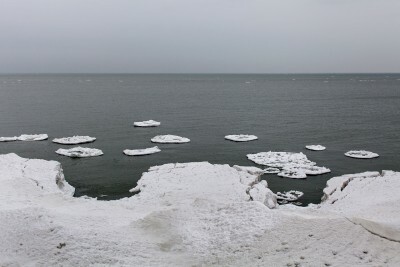 The sea ice in this photograph is thin, fragmented, first-year ice. Since temperatures are warming faster at the poles than anywhere else, the chance of thick, stable, multi-year ice forming in the future are decreasing. Permafrost, permanently frozen soil, makes up over 24 percent of the land in the Northern Hemisphere. 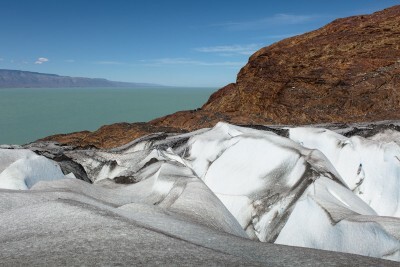 With global temperatures rising, permafrost melt is causing erosion, landslides and sinkholes and its stored carbon is being released as two powerful heat-trapping gases: carbon dioxide and methane which feed into a “feedback loop” of further warming and melting patterns. Hunters, both human and animal, rely on sea ice to help them stalk and catch their prey. 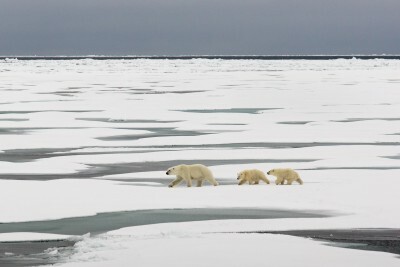 With thicker multi-year sea ice melting, travel across large distances on thin first-year ice, like that seen here, is very challenging for polar bears and other creatures that have relied on it for generations.